Exclusive glow in the dark UV bracelet from Head Space. Pink coloured Spiky Rubber UV Beads, White glow in the dark beads with Black coloured beads. Exclusive glow in the dark UV bracelet from Head Space. 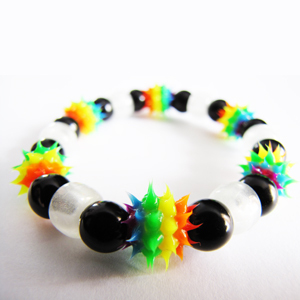 Blue coloured Spiky Rubber UV Beads, White glow in the dark beads with Black coloured beads. Exclusive glow in the dark bracelet from Head Space. Neon Orange and White glow in the dark beads with�Black coloured beads. Exclusive glow in the dark bracelet from Head Space. Neon Green�and White glow in the dark beads with�Black coloured beads. Exclusive glow in the dark bracelet from Head Space. Neon Pink�and White glow in the dark beads with�Black coloured beads. Exclusive glow in the dark bracelet from Head Space. Purple�and White glow in the dark beads with�Black coloured beads. Exclusive glow in the dark bracelet from Head Space. Blue�and White glow in the dark beads with�Black coloured beads. Exclusive glow in the dark bracelet from Head Space. Yellow�and White glow in the dark beads with�Black coloured beads.